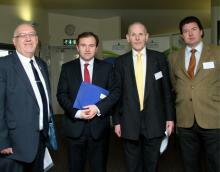 DEFRA Minister George Eustice MP praised the Heart of the South West Rural Growth Network (RGN) pilot on a recent visit to Devon. The Food and Farming Minister spoke on support for rural business at the Growing the Rural Economy event at the Cullompton Community Centre. The event, organised by Devon County Council, was part of the work by the Heart of the South West LEP Rural Growth Network (RGN) pilot. The pilot was awarded £2.9 million from DEFRA to develop a network of rural enterprise hubs to support micro and small businesses across rural Devon and Somerset, and is expected to help create around 1,300 jobs in the area. The Heart of the South West Rural Growth Network is one of five pilot areas chosen to tackle the barriers to economic growth in the countryside, such as a shortage of work premises, slow internet connectivity, fragmented business networks, competitiveness, lack of properly skilled people, and support for micro-enterprises. The Minister added that that broadband infrastructure investment was a winning rural policy and that unlocking rural growth was particularly relevant to the area represented by the Heart of the South West Local Enterprise Partnership, which has one of largest rural populations of all the LEPs with over 640,000 people, 38.5% of the population, living in rural areas. As part of his visit, the Minister also opened the new £1 million workspace hub at Bicton College, which received £300,000 of RGN capital funding to convert an old farmhouse into six office units to help start-up businesses. He also toured Hillside Foods, based in Kenn, which was awarded £27,000. This will fund the expansion of the business and recruitment of up to three additional staff and allow Hillside to nurture other emerging small business by allowing them access to their product development kitchen. Around 20 rural micro-businesses have received a share of £1 million Heart of the South West Rural Enterprise Grant (REG) over the past year, secured from DEFRA and the Rural Development Programme for England. The REG programme has provided capital grants to rural enterprises with fewer than 10 employees to boost growth and create jobs throughout the area.